Essentially a facelifted and renamed version of the SLK, the SLC features a new front bumper, a revised diamond grille, and restyled headlights with integrated LED daytime running lights. Keen-eyed observers will also notice a sportier rear bumper, new LED taillights, and a revised dual exhaust system. The car has also been equipped with an improved retractable hardtop that can be opened or closed at speeds up to 25 mph (40 km/h). The interior largely carries over but there's a new sports steering wheel, a revised instrument cluster, and aluminum trim with a carbon fiber-inspired finish. Designers also added revised leather and Nappa leather upholstery as well as a new COMAND infotainment system with a higher resolution seven-inch display. In the United States, two engines will be available. The entry-level SLC300 has a turbocharged 2.0-liter four-cylinder engine that develops 241 hp (179 kW) and 273 lb-ft (369 Nm) of torque. It is connected to a nine-speed automatic transmission which enables the car to accelerate from 0-60 mph in 5.7 seconds before hitting a top speed of 130 mph (209 km/h). 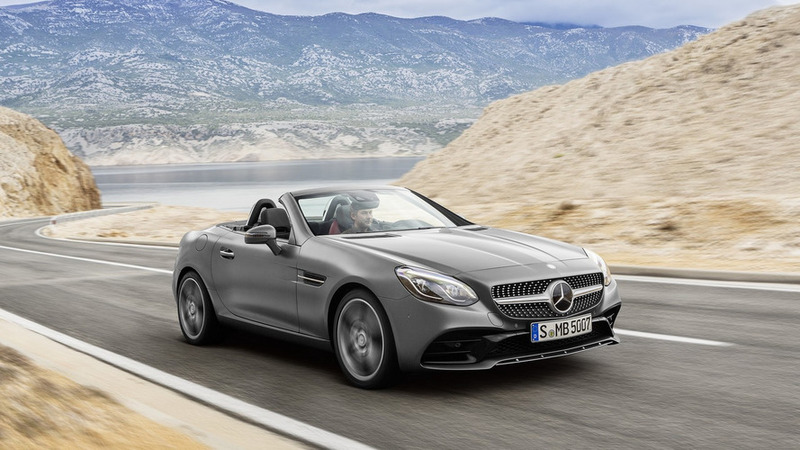 Moving up, the Mercedes-AMG SLC43 rewards buyers with a twin-turbo 3.0-liter V6 engine that produces 362 hp (270 kW) and 384 lb-ft (520 Nm) of torque. The model is significantly less powerful than the outgoing SLK55 AMG but it manages to accelerate from 0-60 mph in 4.6 seconds before hitting a limited top speed of 155 mph (250 km/h). Speaking of performance, the SLC gains a standard DYNAMIC SELECT system which features Comfort, Sport, Sport+, Eco, and Individual modes. The system modifies the engine, transmission, steering, and suspension settings accordingly. Last but not least, the SLC features a rearview camera and a newly standard Active Brake Assist system which warns the driver if a collision is imminent. If the driver fails to respond, the system will automatically apply the brakes to prevent or reduce the severity of a collision.